Hello all, long time no see! I posted my last walk in 2014. After that, I walked elsewhere. The walk from my home to Rome in 2015, changed something: I no longer preferred the illusion of wilderness, but had learned to appreciate rural areas, city centers and even the 'in between' zone of industrial estates, shopping centers and apartment blocks. 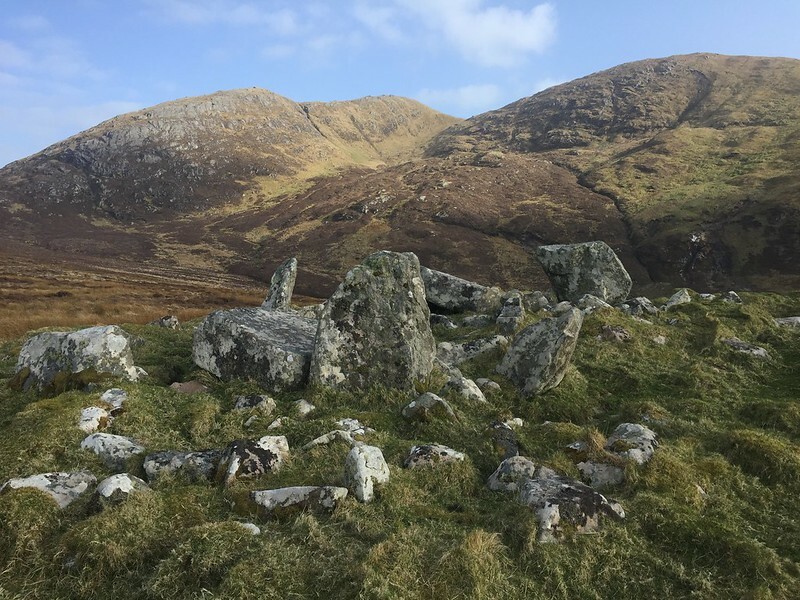 So when in 2018, my love for the Highlands begged to be rekindled, I looked for a mix of rough and inhabited. 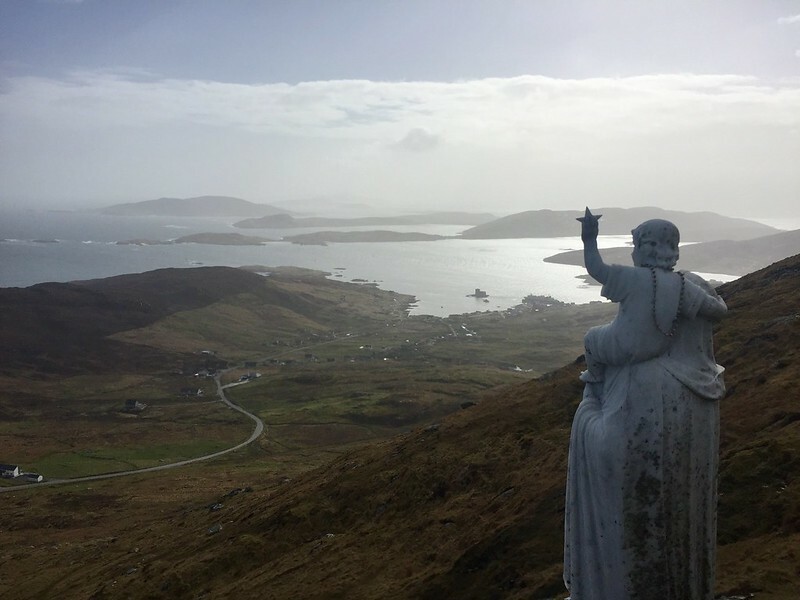 April 17, I arrived on Barra. A walk north to Harris seemed to fit my idea of a balanced walk. 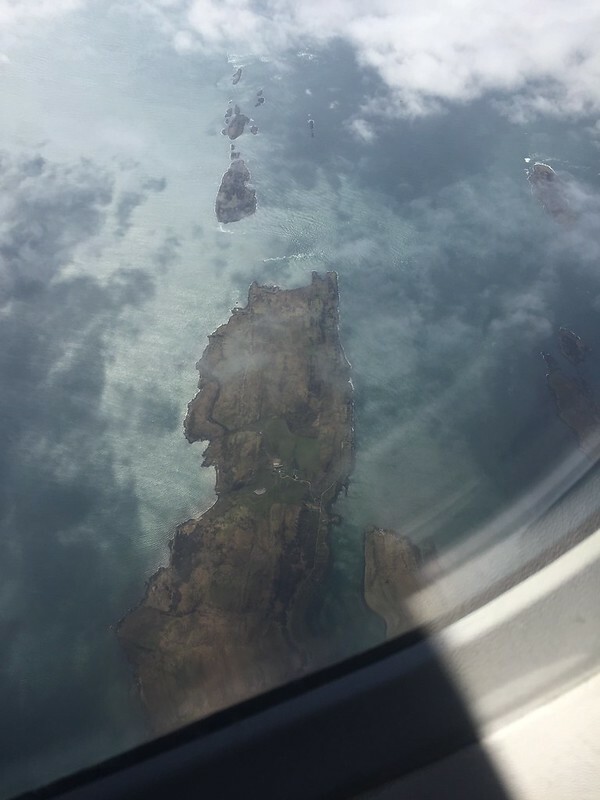 To set the scene: I saw an eagle within half an hour after departure from Castlebay. 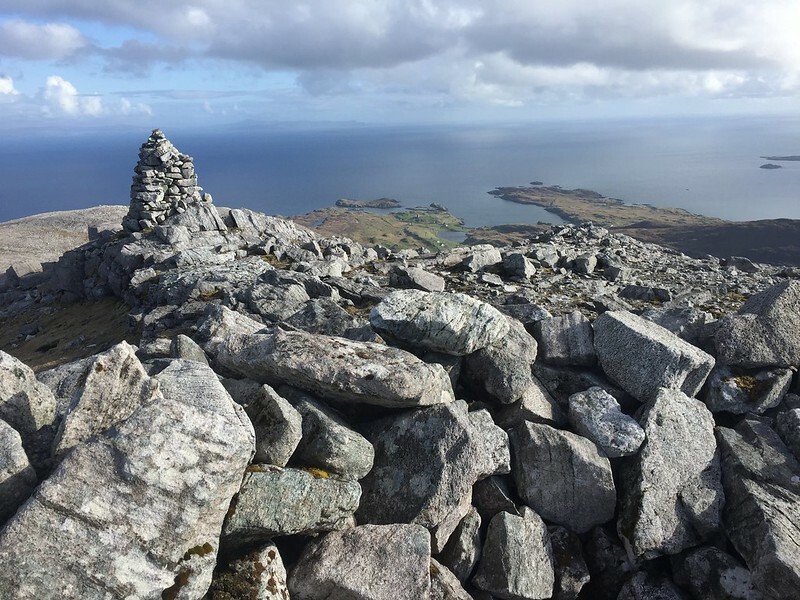 I crossed sunny Barra via the Virgin and the Child, the summit of Heabhal, a chambered cairn and a dun. 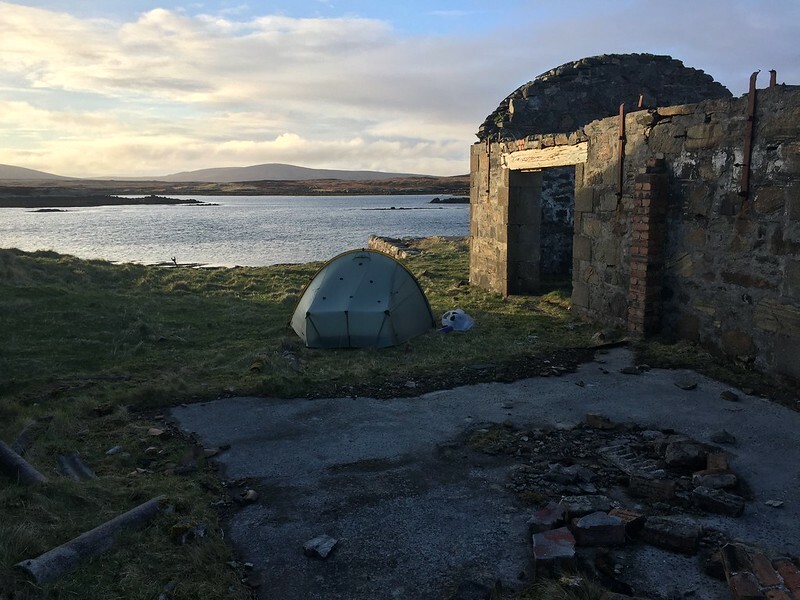 My route touched the Hebridean Way and crossed over to Loch an Duin, where it was windy and un-campsite-looking. 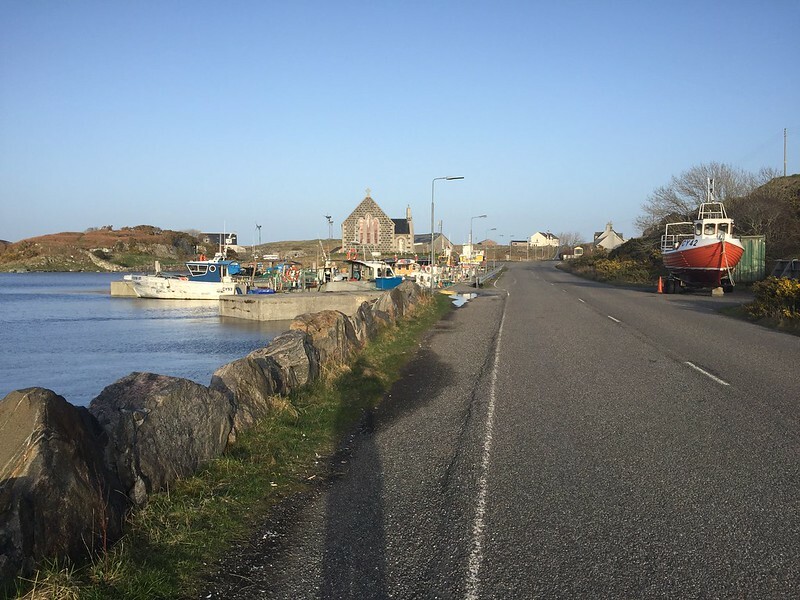 In Thiarabhagh, a pleasant looking village and harbor, I walked over to the Hotel, looking for a meal, but didn’t like the look of it and walked back, soon accompanied by a family of four. He worked at the airport, she was in childcare business. Friendly people, relaxed. 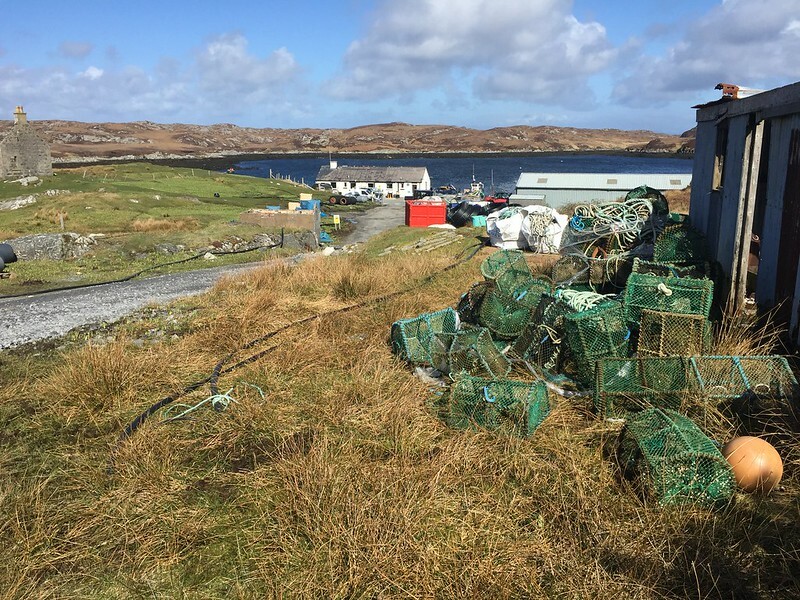 After a life on the mainland, they had settled on Barra, where they were born. They advised me to find a camping spot beyond the airport. Too far out for my taste. When I saw a wooded hillside a mile up the road, I camped on a flat spot between trees higher up. 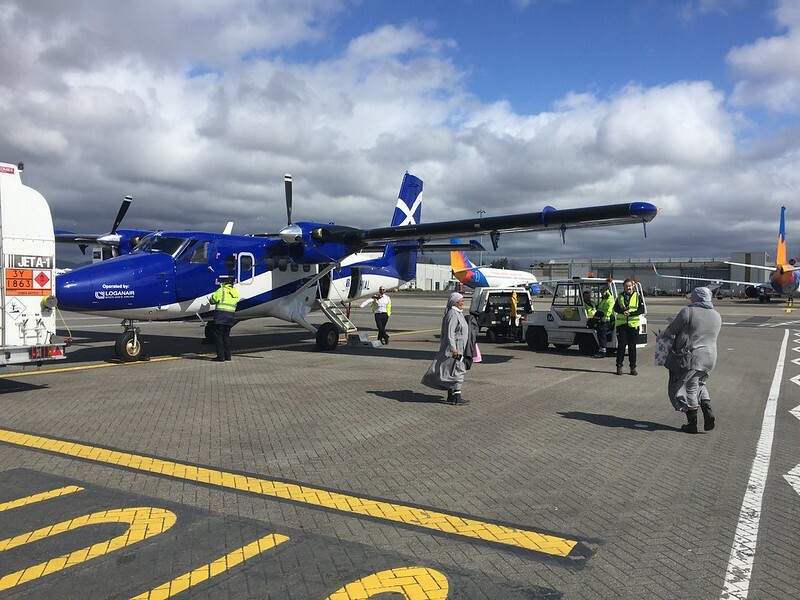 Two nuns boarding the Twin Otter to Barra, one blaming the other "you do not pay me enough for this!" Craignish Point and Garbh Reisa. In the morning, I caught the ferry over to Eriskay. The sea looked choppy, but the crossing was alright, with great views all around. I climbed Ben Scrien, a nice little hill, hardly mentioned in any guidebook, but characterful and well worth the climb. Very windy on the summit. In the village shop I bought a snack and crossed the causeway to South Uist. I followed various paths along the coastline north. 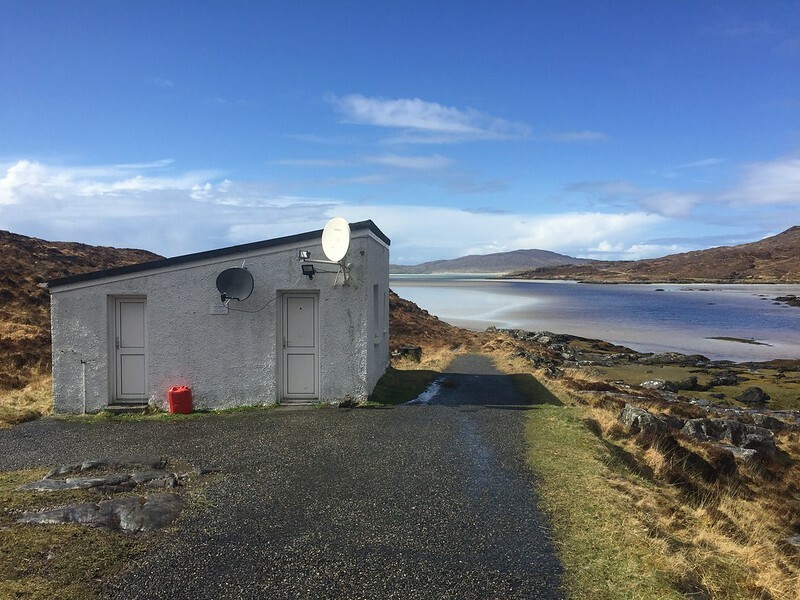 At an aisled house at 733203 my route turned inland, aiming for the Coop at Daliburgh, a well sorted shop. Walking along the road to Lochboisdale was quite boring, and quite wet lateron. With some 2 miles to go a driver relieved me of the drudgery and drove me to the pier. 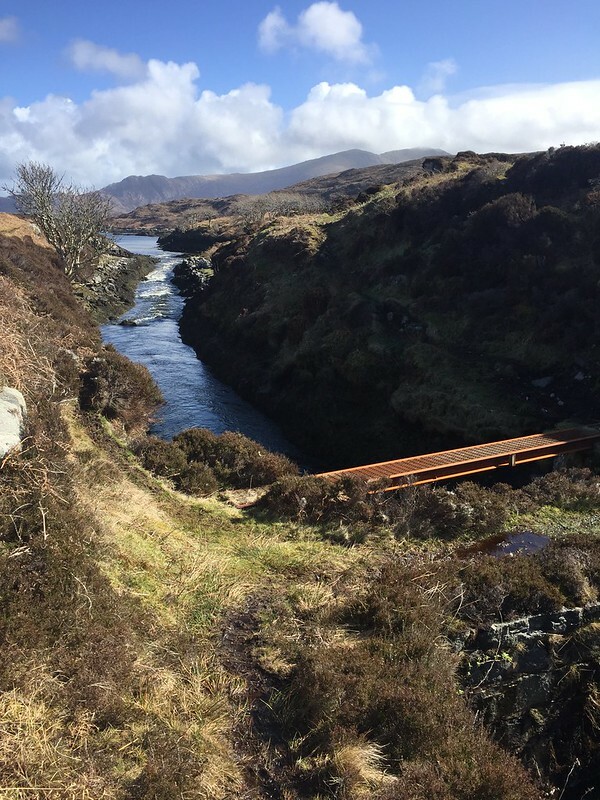 Near a farm called Lasgair I crossed the river northward to connect to a track to the foot of Triuirebhein. At a water work, a group of concrete basins, I tried to pitch the tent. The first spot was too windy, but I cooked dinner at least, the second spot was on the lee side of a basin, but still too windy, and the last attempt was without tent in just a flysheet bivouac. In the meantime, it had started to rain. When rain and wind picked up a notch, I decided to walk back out and wished I had paid more attention to navigation on the way in. 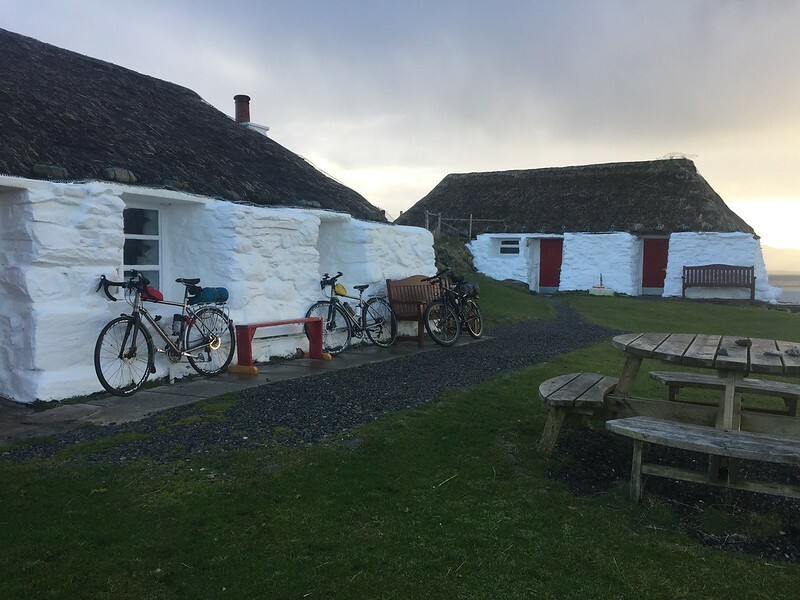 I arrived at the Lochboisdale Hotel around 11pm. Hot bath, hot chocolate and a good night sleep would recuperate me nicely..
After the rains, the weather felt clear and fresh. 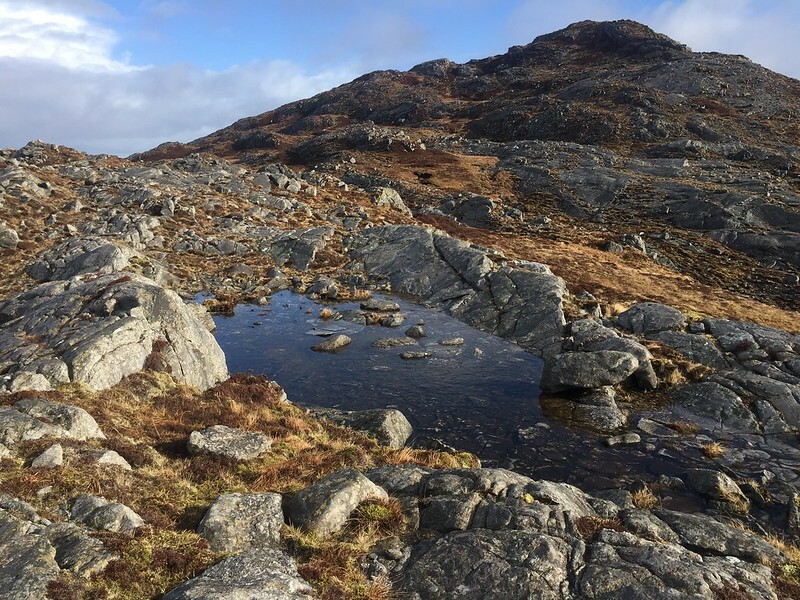 I retraced my path to the water intake and on to the foot of Triuirebheinn. The terrain could not be called solid ground in any way. I took my time climbing the hill. On the connecting ridge northward, the walking was much better, drier underfoot. Since I did not plot a route, and just decided to find my way, I was surprised by very steep heathery steps on the way down, which called for a lot of weaving in and out. 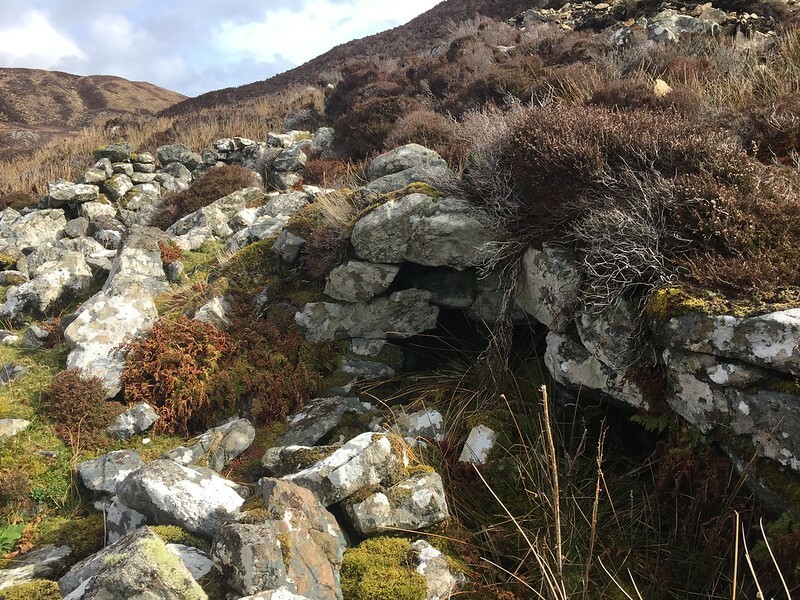 In the Bealach a’Chaolais lies a Souterrain. I could see it had been a nice spot to live in. Warm, less windy than elsewhere. Stulabhal is a nice hill. 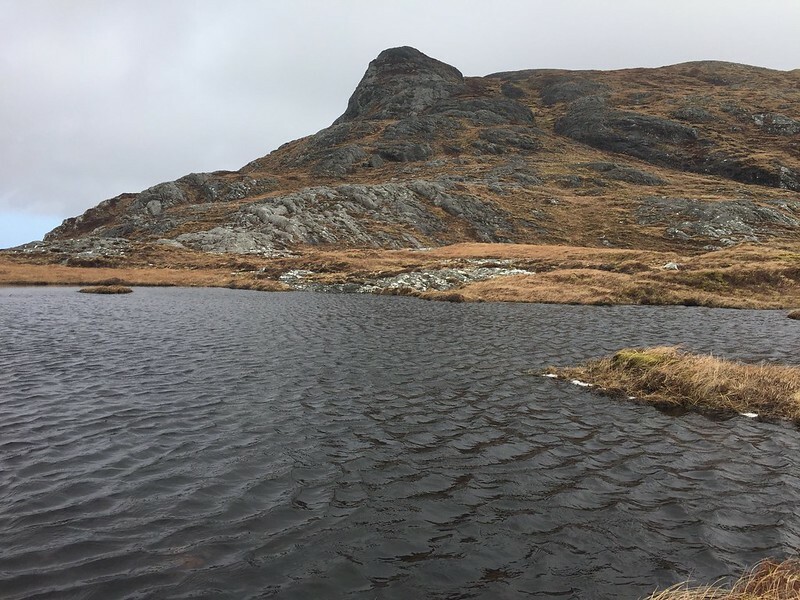 From the south, one climbs onto a small plateau with two lochans, with an attractive buttress right above them. You climb a broad gully, and come out on the summit. Great views, at only 384m. The way down was across curved gneiss banks, like a pod of whales. I had a good lunch on the shores of Loch Snigiscleit. 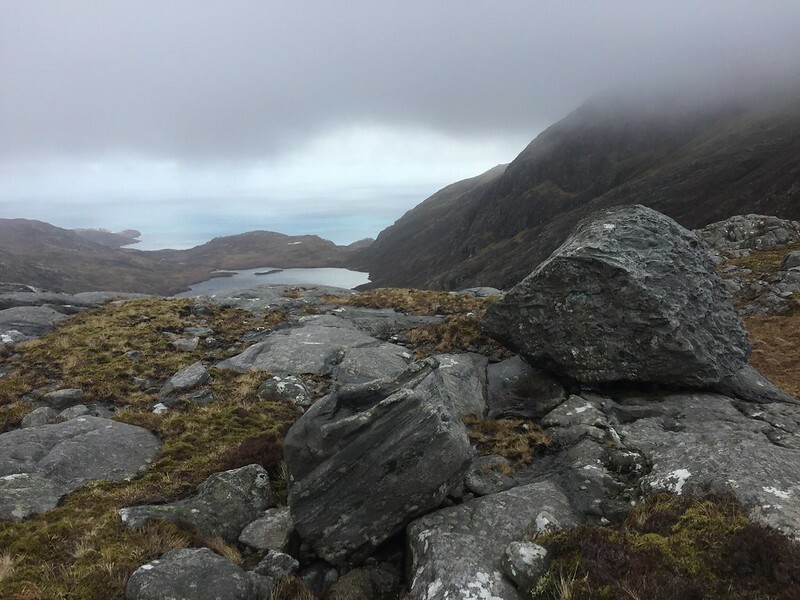 To reach Loch Ainort, I needed to climb Beinn Aleinn almost to the top, and cross no man’s land to the shores of the sea loch, which was to be rounded clockwise. A long way on asphalt, I kept myself entertained by looking at the farms and houses and the materials/mess around them. On the north shore of the loch the houses get quainter, until you reach an arboretum, a tree garden. Meanwhile, low tide turned the narrow loch into a labyrinth of skerries with oystercatchers flying on and off to try and pry shellfish from between the kelp. I pitched the tent in full view of Beinn Mhòr. The summit became visible, and the mountain bathed in sunshine for the rest of the afternoon. I could not be seduced to climb it though. 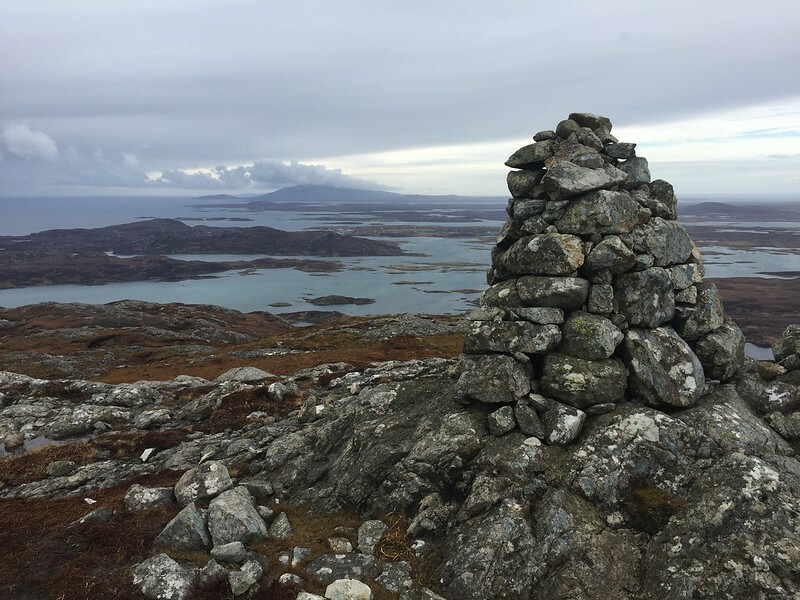 Stulaval trig point, looking north to Beinn Mhòr, South Uist. I departed after the early morning drizzle ended. Higher up, I picked up a path, which would lead me to the Bealach Crosgaird, I was sure. 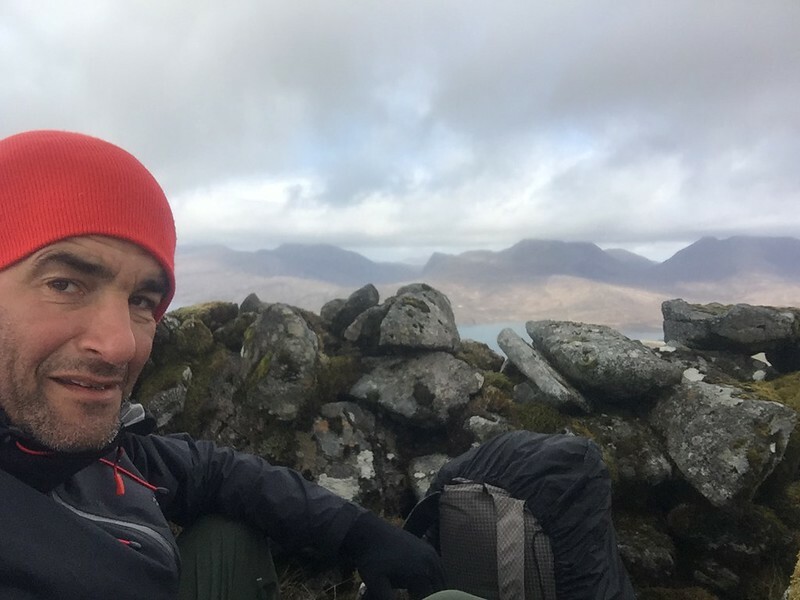 Naturally, this confidence was not based on navigational rigour, or so I found out on a bealach more than one kilometer to the south, near Beinn na Tobha. 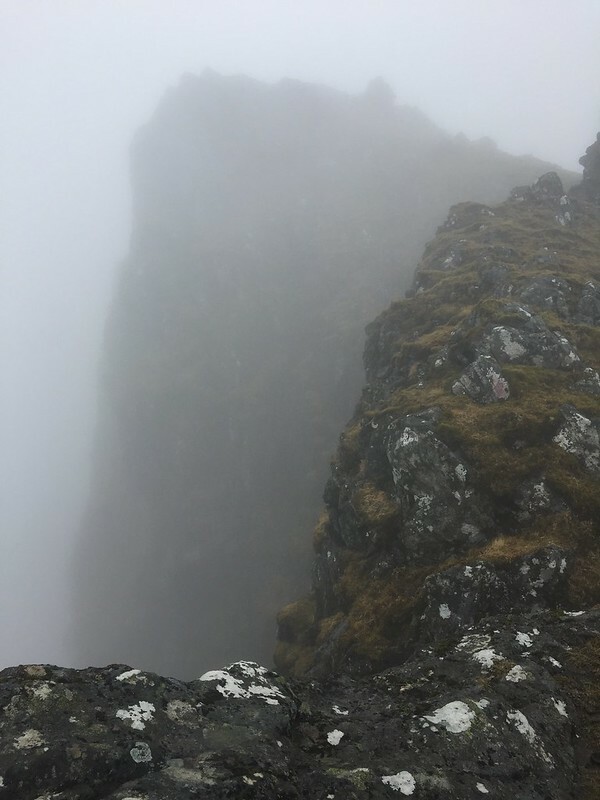 No visibility, so the climb up to Beinn Mhòr was not too pleasant. A trig point can improve such a mood, because of the locational certainty it gives, but in this case also because this particular one looks very good, made from local stone. After this, I followed the ridge north. When the mist swirled the right way, I could see that the summit of the hill is perched above a steep drop. 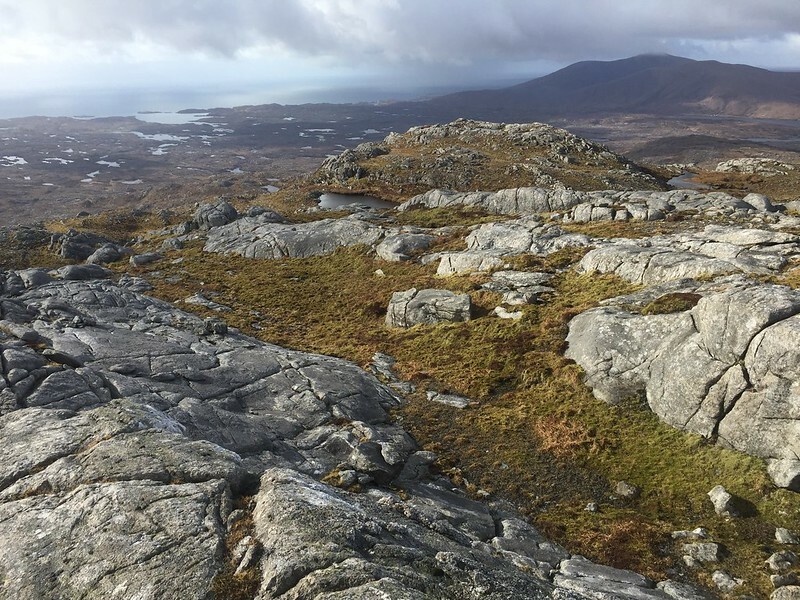 I skipped Beinn Choradail, meandered through a labyrinth of rocky outcrops on the way to the foot of Hecla and had a good look down Gleann Uisinis, looking very wild. Originally I had planned to camp there, but this didn’t fit my other plans. 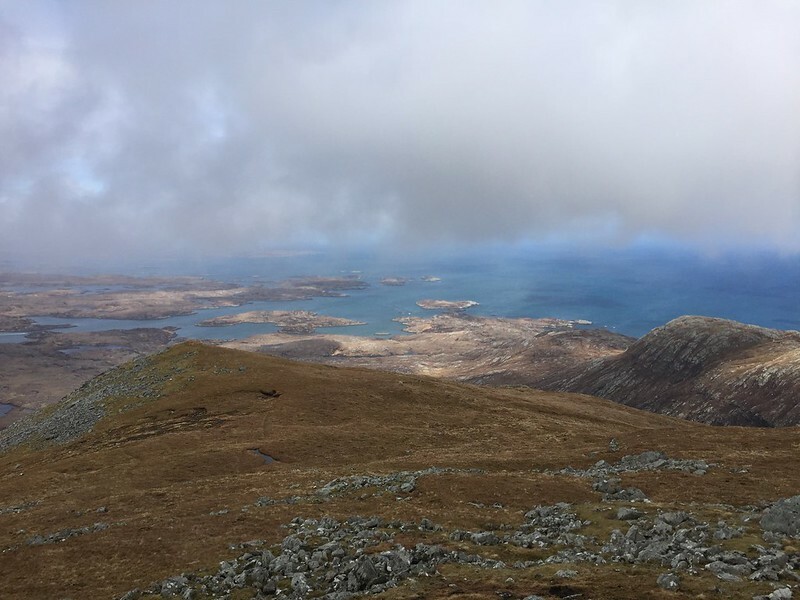 Coming down the north side of Hecla, the views opened up: blindingly bright in browns and blues after the previous clag, the cliffs of Skye in the distance. Crossing the floodgate at NF814402, Hecla at the horizon. Hearty breakfast & good conversations got me underway along the coastline and across the causeway to the shop at Creagorry. I was on Benbecula now, the flattest island. My route took a turn north through Torlum and Griminis. 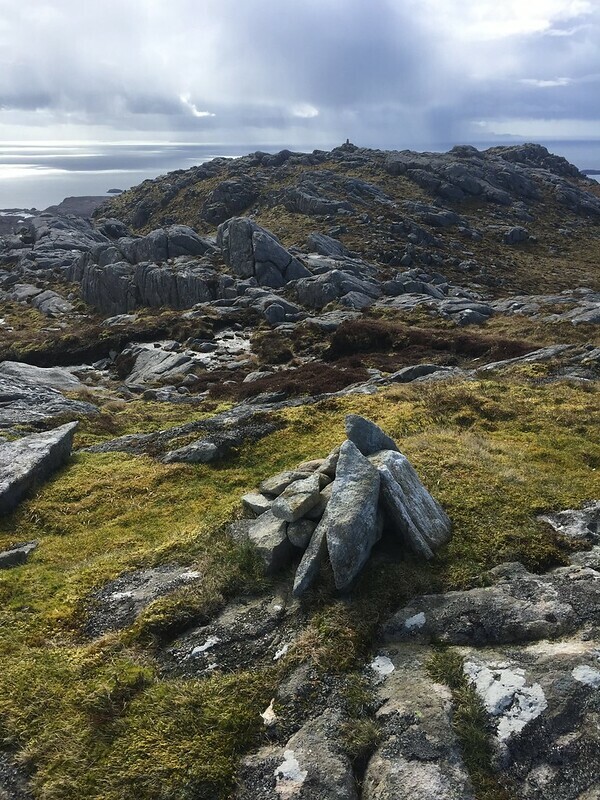 There, a faint track is shown to cross the moss to Baile na Cailleach, but the Cicerone guide I read discourages its use and my eyes gave me the evidence. It might be on the map, but it is a ribbon of water so no, it is not fit for walking, I concluded. I rounded the coast to the bay of Culla, a nice beach with lots of birds. I ate my locally produced hot-smoked salmon and called home. On top of dykes of big round stones I reached Balivanich. Now I like my villages and towns ‘real’ even when it involves ‘ugly’ to ensure authenticity (yes, a snobby tourist’s reasoning ), but this town is beyond charming ugliness, and so this tourist just visited the supermarket and decided to take a look at the timetable in a bus stop. 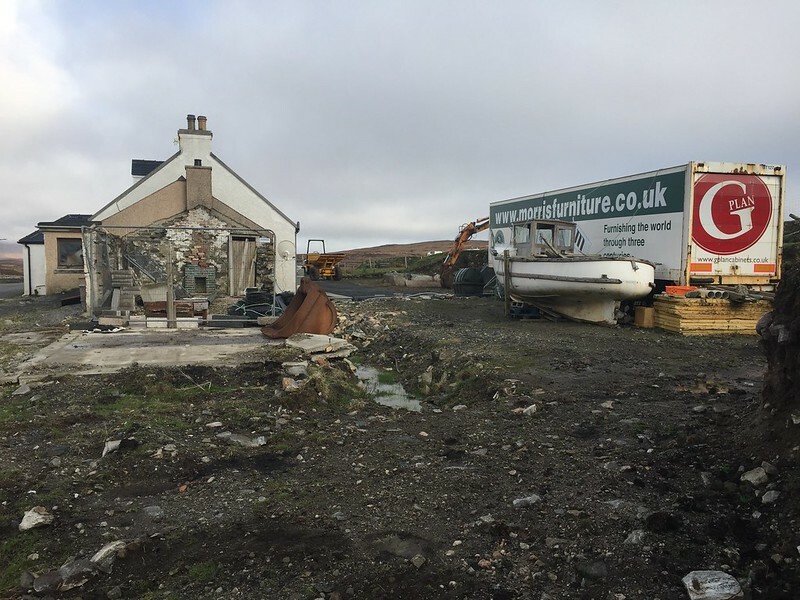 It was 3pm, at 3.02 a bus across the causeway to North Uist appeared. 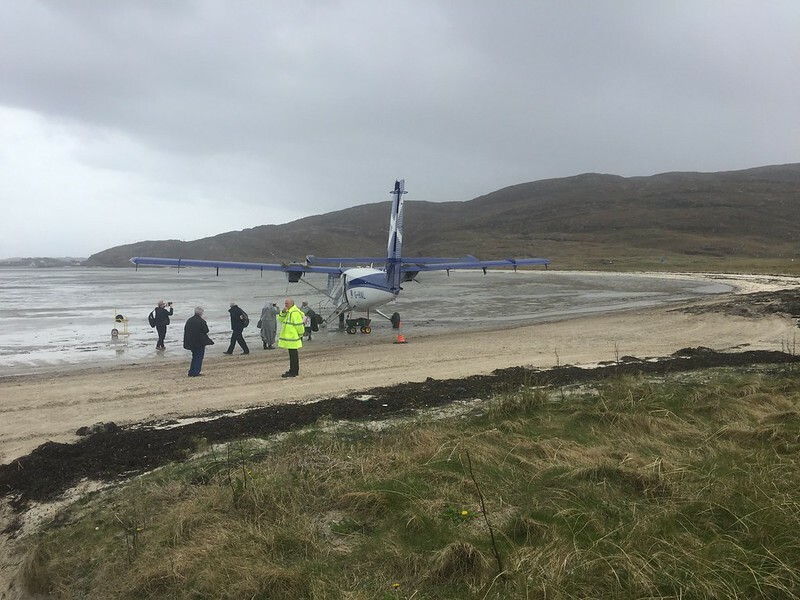 Therefore, I landed on North Uist at 3.15. Hurray for opportunism . I followed the road eastward to Cladach Chairinis, hoping for a nice camping spot on farmland. No-one to be seen, so I ended up in a ruined sheiling on the peninsula of Calternis. Rain passed by in the night. I waited for it to subside and left at 10.30. I could see the foot of the hill, so took my time climbing it, slow enough for the views to have appeared when I arrived on the summit at one. In my humble opinion Eaval is the best hill of this trip . Its setting, its shape and in particular its views are grand. The view towards the sea is across a patchwork of lochans and rocky banks. 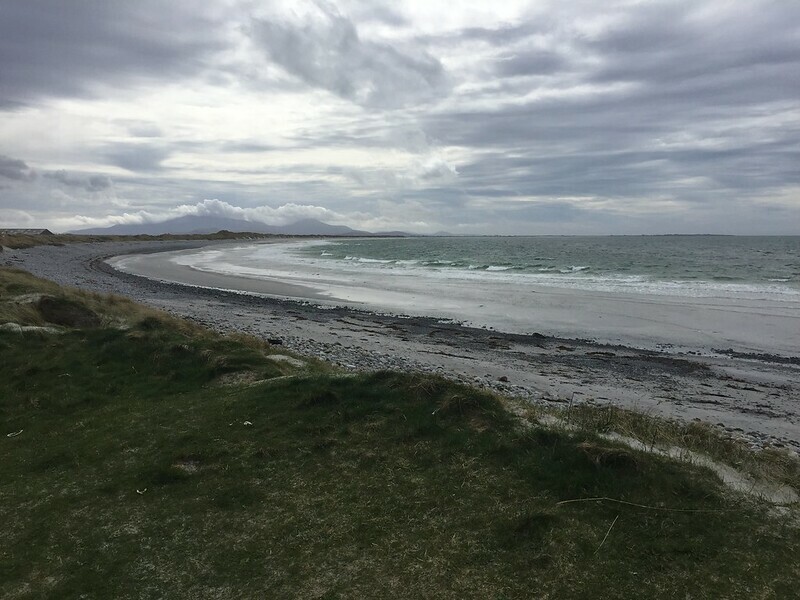 Benbecula shows its likeness to a drenched and worn fiber kitchen cloth and on the southern horizon sit Hecla and Beinn Mhor, whose summits never ever were without cloud since my day 3 camp. A puzzle can be played comparing view and map: say if a loch is salt or fresh. I descended the hill eastward, to find a natural arch in the cliffs at 926606. The walking on the cliff tops is fine. Dry underfoot, with the dark sea and the white foam, the petrels, the short grass. I lunched near the arch to watch the swell hit the rocks. My route turned northwest towards Burabhal. I met two islanders and their Belgian friend near its summit, who questioned my sanity (or praised my attitude) for being on this hill. They were regulars. The walk to the head of Loch Euphort is long, since this sealoch cuts Uist almost in two. Rain set in halfway. I visited a stone circle, just to distract, and reprimanded myself for postponing finding a place to camp. 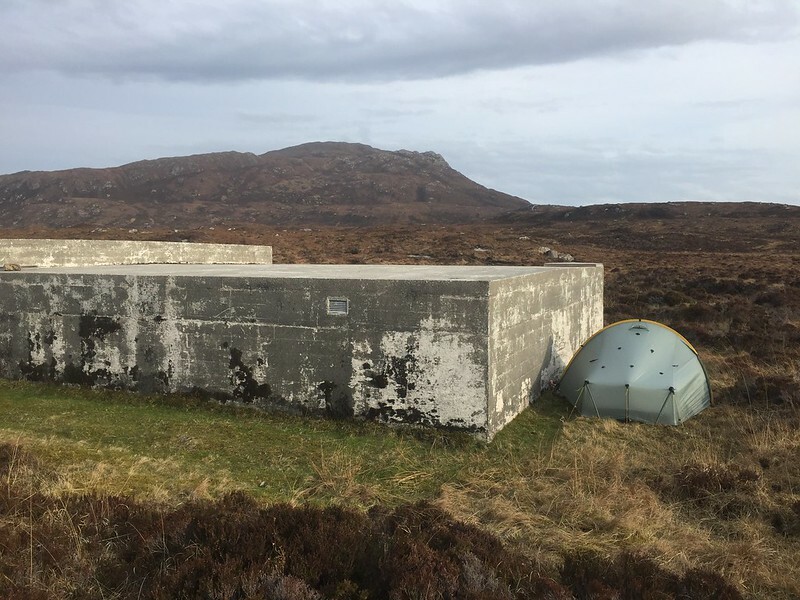 One of the tricks of wild camping in inhabited areas is to find the right mood to go and ask for water and permission. Eventually, I rang a doorbell and asked if the derelict harbor building on the pier would be a convenient spot. Inside a roofless building I pitched, only to find out the grass was underlaid by concrete. I repitched outside for a windy night. This day I remember as one of many miles of walking along the A865. On these islands, a bike is the best transport, followed by a kayak. Walking across the land one will resort to use of the main roads, sooner or later. Fortunately, there’s not very many cars on them. I walked on to the Bayhead shop where a shop assistant got me coffee from the machine. 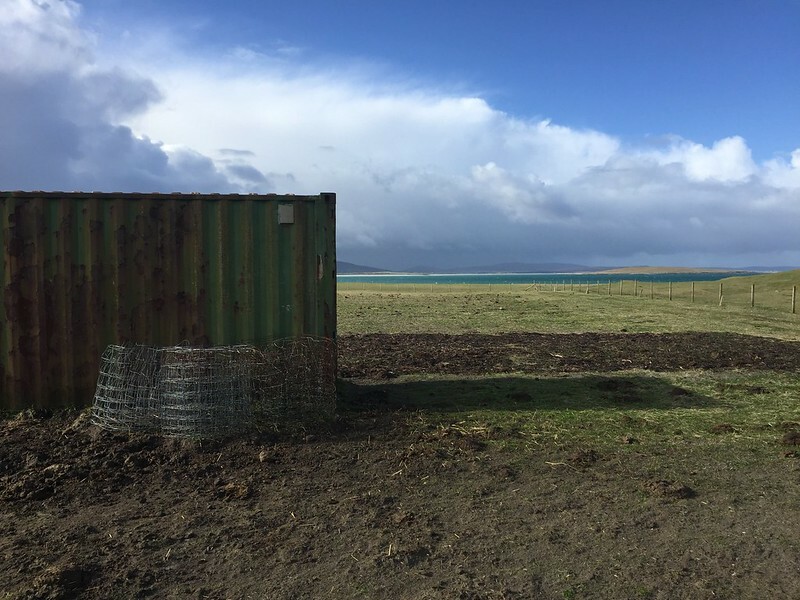 I crossed Balranald, an RSPB-reserve. Not many birds here, but in general I’ve seen a lot, mostly snipe. 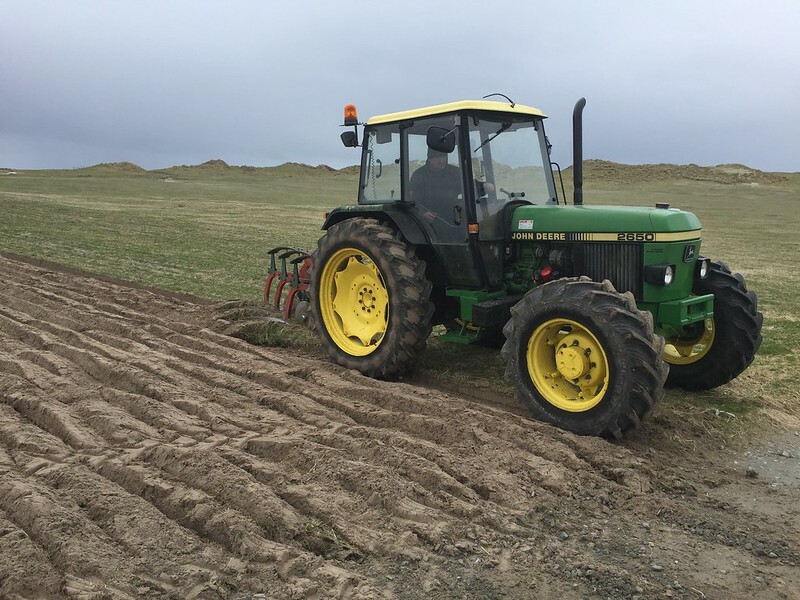 A farmer, turning the ground, stopped his tractor for a chat when he saw me taking pictures of his work. He reminded me of my granddad, who was an expert with tractor and plough, me sitting on the fender of the tractor, next to him, long ago. 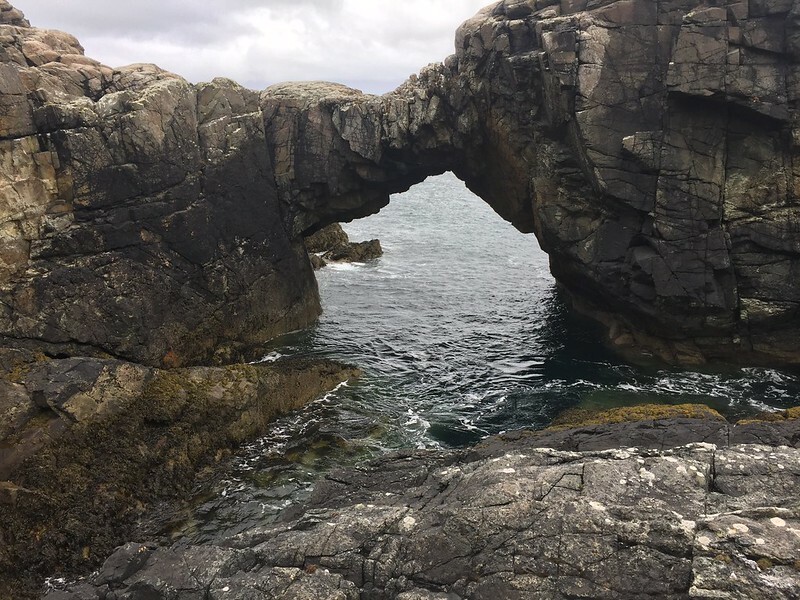 I walked along a wide beach and visited a headland (Gearraidh Gall) with another natural arch. Here, petrels soar above the cliffs, dropping down to the waves to gain speed, only to return to same apex again and again. The flying petrels watched the raven, who tried to find out whether there’s eggs underneath the sitting petrels, operating in a sly manner. Upon returning to the A865 I fantasized that history would repeat itself and I would bump into a bus stand minutes before the bus arrived. There was no bus, the road is long and undulating, and it started to rain rather continuously. I looked over my shoulder to see cars coming (I could see miles of road) but a) no-one came and b) those who drove by didn’t pick me up and c) those who tried (a BMW Z4 roadster) discovered I wanted to go the other way. 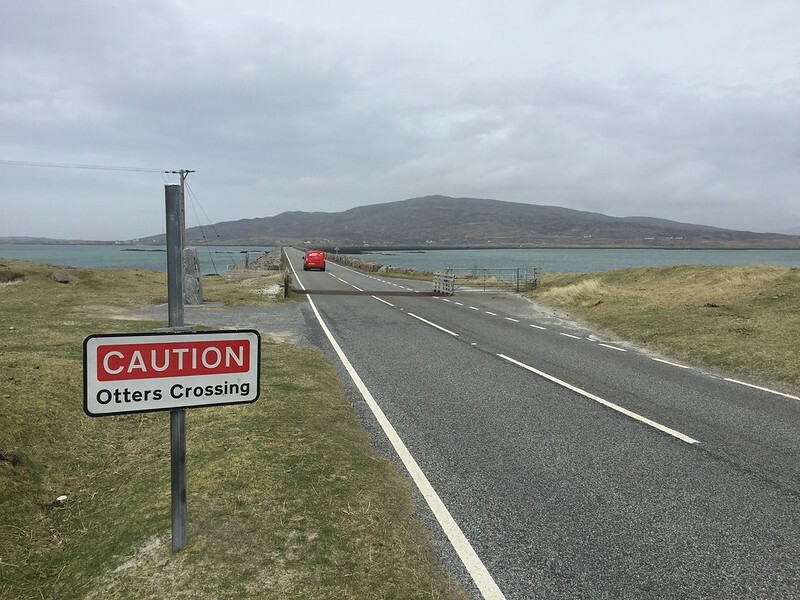 But d) an American pensioner in a rental car had all the time of the world to bring me to the Berneray Causeway, chatting all the while . 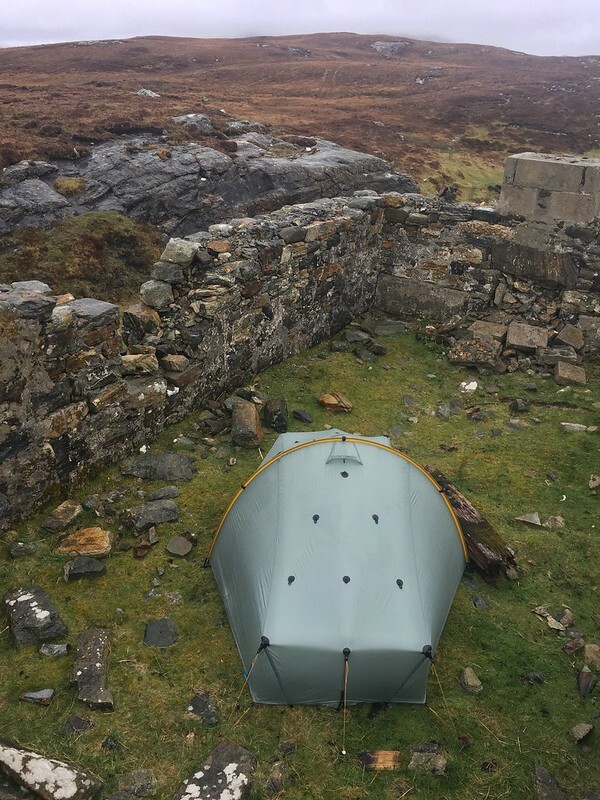 I had planned to camp, but the Gatliff Trust hostel was warm, dry, cheap and I would have a room to myself. Ian and Dorothy, Glaswegian cyclists, provided good company. I hope I did, too. I woke to sunshine and blue skies at 6. 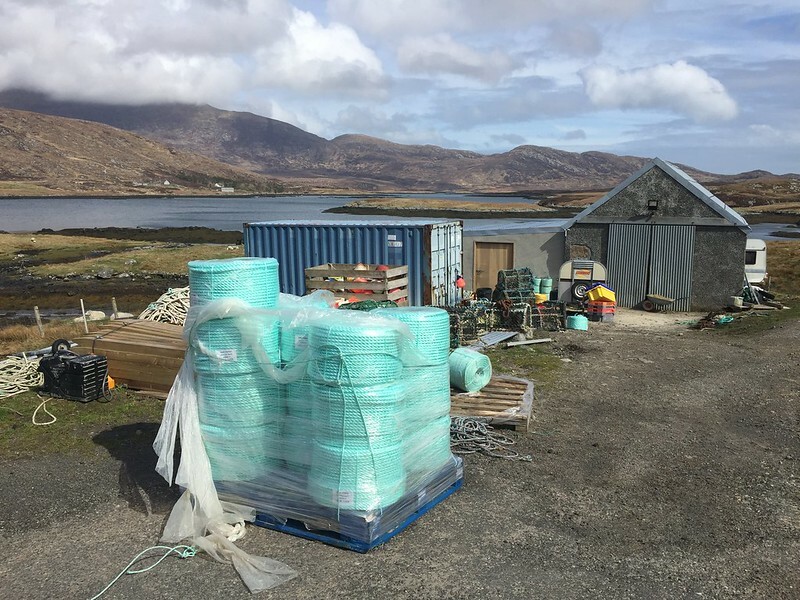 Before the ferry to Harris, I wanted to have walked round the island, so I ate and packed quickly and was on my way at 7. Very pleasant walk to the road end, and then up Beinn Sleibhe and anti-clockwise down the west coast. 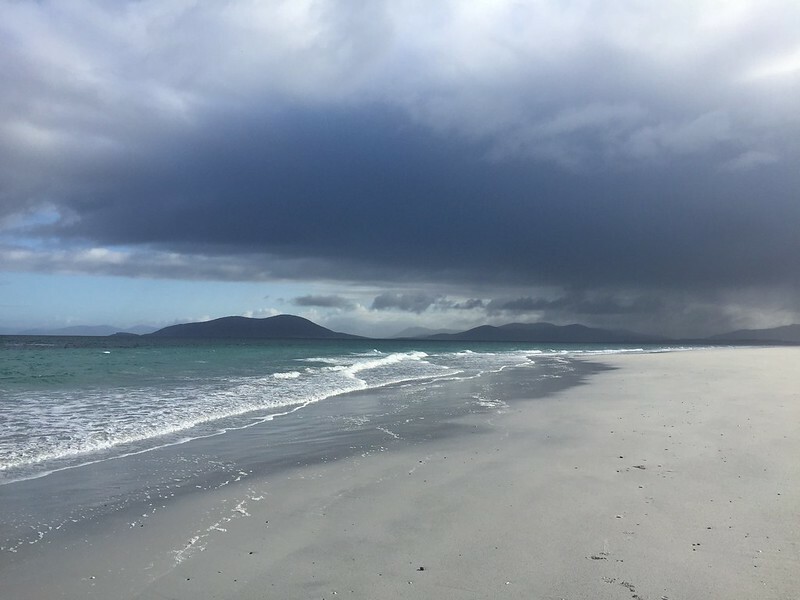 Fabulous beaches, windy seas, dark skies, stunning views across to Harris. 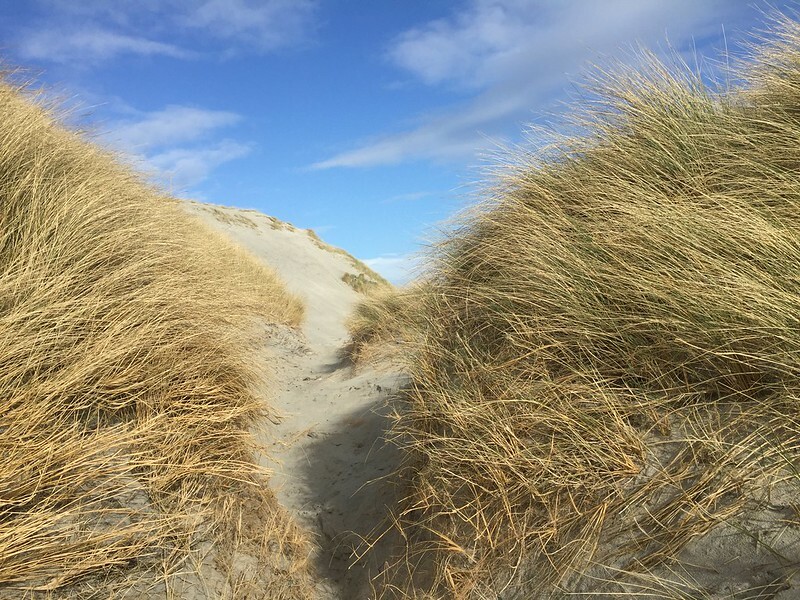 The south-west side of Berneray is where dunes fade into machair and meadowland beautifully, and across the stony beach of Loch Buirgh I made the ferry with 15 minutes to spare. 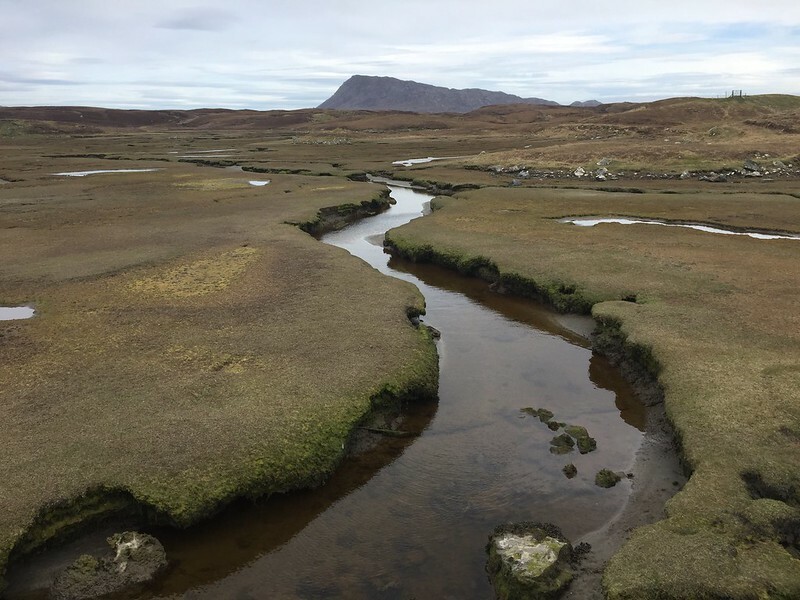 Peat was harvested near Loch Langavat, where I turned straight north into the wild of Harris. The walk in was enjoyable, especially when a sea eagle came to circle me. I video-ed it, but soon felt like an intruder and moved on. 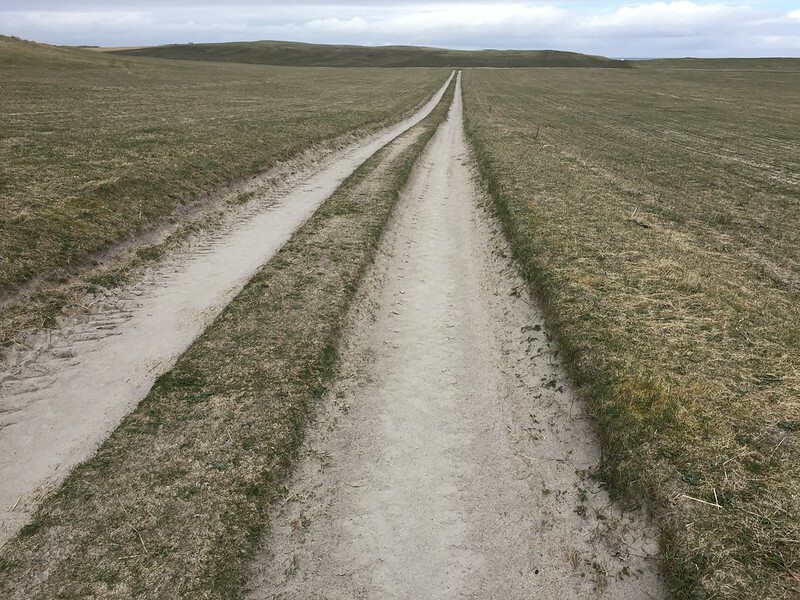 After that I got tired, and couldn’t find a place to camp in the usual type of terrain: none of the grassy patches in river bends were dry enough, no ridges were still enough, and no plateau was flat enough. I ended up on a heathery promontory, the tent pitched so skewed and crooked, the inside was shaped like a beach chair. 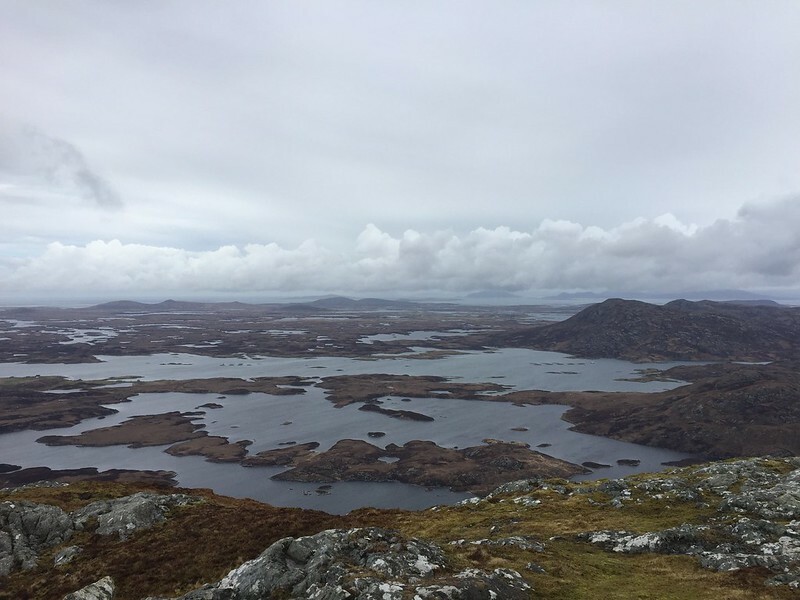 The place is called Loch Dubh Màs Holasmul, doesn’t it sound like a desert? 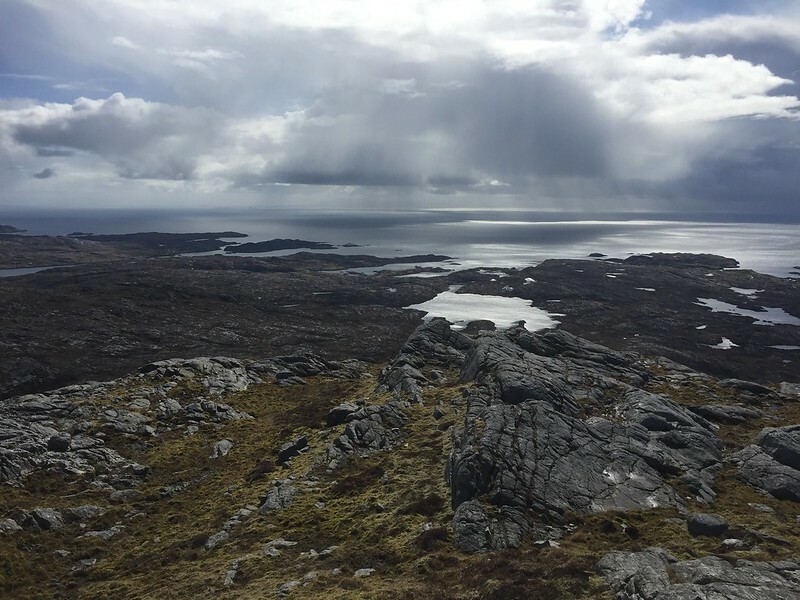 The South harris interior is not seen as being of any interest to hillwalkers, not a single line is written about it in my SMC guide. But try the satellite view and you’ll see: these hills are rough. They were in the path of glaciers many times, hence the elephant skin look. Try climbing them and you’ll notice the lack of any logic in the terrain, and when you stand on a summit and look across to the next hill, you’ll notice the hills are covered as thin as possible by soil and vegetation, rock jutting through the tattered skin everywhere. Many false summits too. Heileasbhal Mor, An Coileach (with a curious notch in its skyline between the high point and the trig point) and Ceann Reamhar na Sroine are quite a handful. A feast for lovers of empty, pathless terrain. To finish it off, an exciting gully in the cliffs of Creag nan Eòin lands one on the path through Bealach Eòrabhat, a good track (coffin road?) to Luskentyre. Some heavy showers rolled in so I took a longish break on the doorstep of a white shed/house where the Abhainn Lacasdail joins the sands. 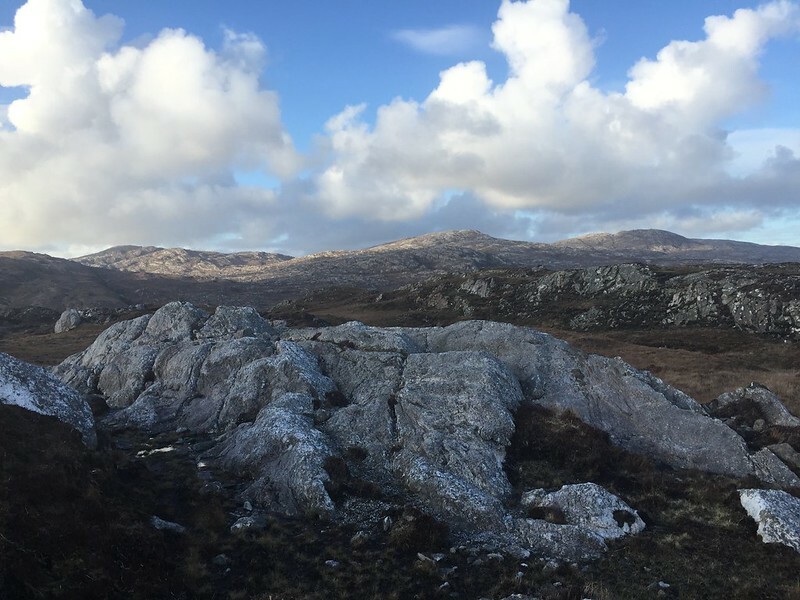 My route turns north-east across Ceann Reamhar and down to Tarbert. Again, not many suitable camping spots, so I walked into Tarbert. The hotels were woefully expensive, but the fish’n’chips were quite good and the backpackers Hostel was kinda perfect, with the company of two Americans of the intrepid kind. One was a guide in Denali National Park, the other planning to write a book about Beaujolais. I dried the gear for the journey home and took the bus to Stornoway in the morning. Looking south from Heileasbhal Mòr, Roineabhal top right. The route on the map was reconstructed from my gpx-files, using less waypoints. Long, straight bits are ferry crossings and in one place a lift in a car or a short bus-ride. 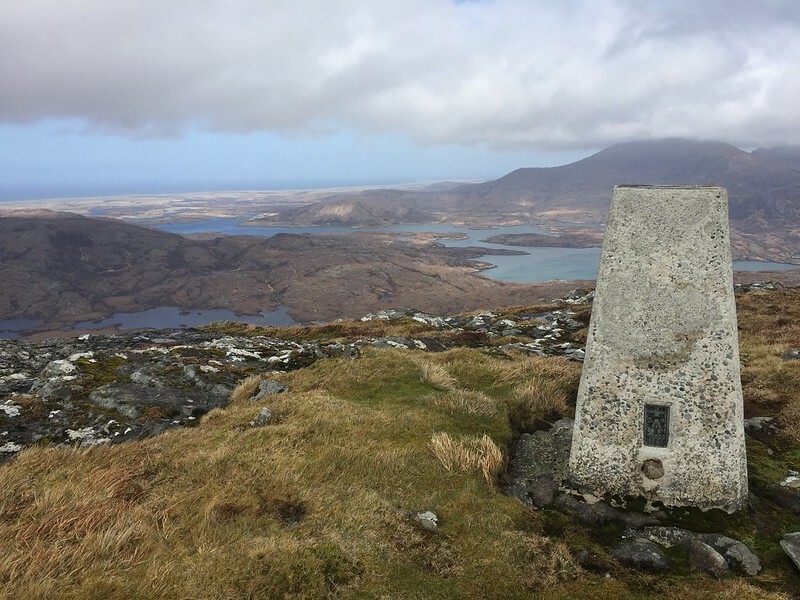 The metres of ascent recorded here are calculated by the WH map, but please be reminded any route on these islands is winding, with a great many ups and downs just because of all those tussocks, hillocks, lochans and stream beds. 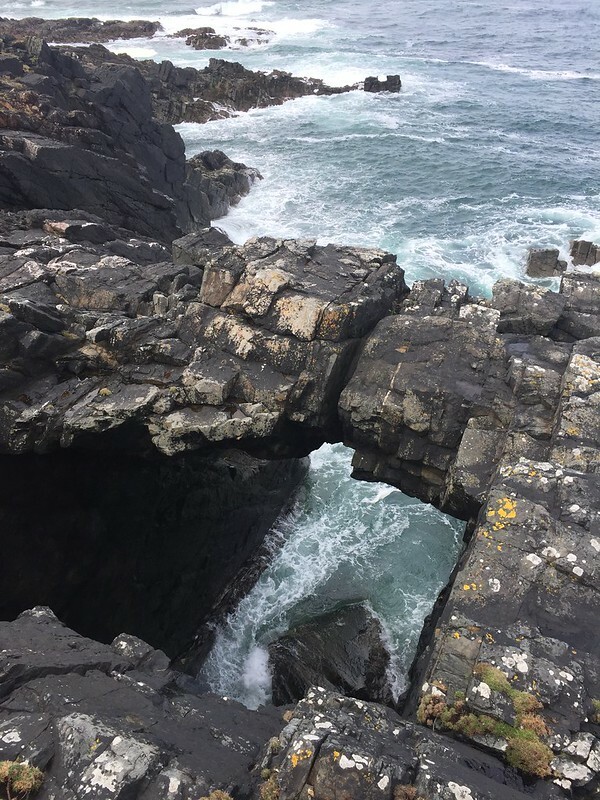 In 2019, in a few weeks, I’ll be visiting Islay, Jura and possibly Colonsay. Looking forward to it, I love islands! Ideal day out: A longish walk through a wooded glen, camping high up, climbing a hill in the evening and returning to the tent to cook.